CK Eternity Summer 2013 for Women creates a sense of summer freshness. 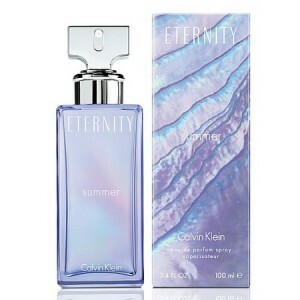 CK Eternity Summer 2013 for Women 100ml. Eau De Parfum - new women's perfume water, from the American fashion company Calvin Klein, published in the annual limited edition collection of fragrances Eternity Summer in 2013. Subtle perfume is a floral fragrance inspired by the beauty of the water endless expanse of sea and the calming sound of the soft sand beaches caressing waves. Air scent suitable for evening events and celebrations, it is packaged in an elongated light purple bottle, cast a rainbow haze and mirror-topped silver spray. This innovation has become a popular summer flanker fragrance Eternity. Easy Pyramid CK - Eternity Summer 2013 for women sounds initial notes: water colors, nuances of bergamot and sea; middle notes: color cotton, osmanthus and wisteria Base notes: musk, sandalwood refined white and amber. Calvin Klein - Eternity Summer 2013 - new fragrance for women, presented the American fashion brand Calvin Klein limited edition of the annual Summer Line Eternity Summer 2013. Romance Eau kind of floral fragrances water tells his admirers about the noise of the waves, warm secluded beaches, has to rest and relaxation, beauty and infinity seascapes. Heroines of Eternity are modern and graceful, charming and desirable, charming and sensual. Evening bouquet bottle poured into elongate light purple with iridescent highlights, topped by silvery mirror spray. Flower and refreshing aromatic composition Eternity Summer 2013 Calvin Klein for women is designed for young women. Aroma is able to create a sense of summer freshness.Floral-water fragrance Eternity was first created in 2005, and then in March 2013 it will be updated, old version. The fragrance is described as light, fresh, clean an d cheerful giver. From the first notes of the fragrance Eternity Summer 2013 for women fragrant gentle freshness of verbena, water lily, violet, it is filled with sensuality of gardenia, jasmine and lotus contains seductive fragrance of mimosa and fig tree.